Our banner designs are creative with strategy! 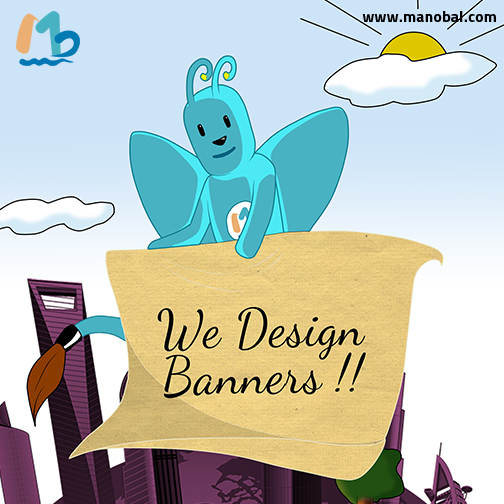 Manobal studios, a leading banner design company offers best and most creative banner designer team under one roof. Here you get a complete, creative and cost-effective design solutions for all your branding and all graphic designing needs. As a highly professional banner design company, we provide web banners with 100% satisfaction guaranteed. we do all kinds of banner designs like Flash banner design, web banner design, roadside banner design, corporate banner design, custom banner design and company banner design with a professional look. we are one of those banner design companies who are committed to meeting or exceeding our customer’s requirements and expectations by utilizing the principles of Continuous Quality Improvement. We believe it’s better to fail in originality than to succeed in imitation.